In Etosha they tend to stick to the south-western reaches of the park around Ombika waterhole. While separate small herds have been identified near Olifantsbad, Halali and Namutoni they are usually seen by visitors to the luxury lodge at Dolomite, or near the camp ground of Olifantsrus. Unlike their prolific cousins – the common impala, the black-faced impala is not optimally adapted for the harshness of life in the African bush. They are somewhat picky when it comes to habitat and rely on the presence of perennial water for their survival. As a water-dependent species, the black-faced impala evolved separately from the more common impala. While the latter are able to roam freely around Africa, herds of black-faced impala were always confined to Kunene by the dry 800km expanse of Namibia’s North Central Region. Unable to escape from ongoing drought, poaching and livestock competition, their numbers soon dwindled to just a few hundred specimens by the 1960s. At this point, the Namibian Department of Nature Conservation stepped in. They relocated 266 of these rare antelope to the Kaross Khoabendes area of Etosha. After the mandatory quarantine period, they were released to fend for themselves and have been thriving ever since. Today, Etosha National Park has a population of over 1 500 black-faced impala and has relocated selected animals to private game reserves in the area. Next time you see a herd of impala in Etosha, spare them a second glance. You just may be breezing past an endangered species. There are a few differences in their lifestyle choices too. 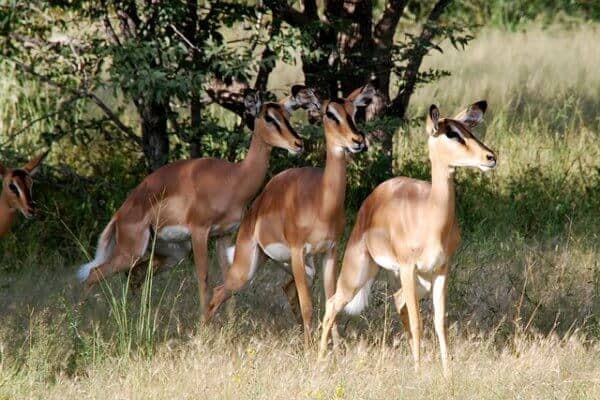 Black-faced impala form smaller herds of 3 to 15 and have home ranges up to 6 times larger than common impala, and they are seasonal breeders, with a single lamb born to ewes between December and January. The mortality rate among lambs is high at 75%. Many of them do not make it past two months of age. Despite these challenges, the black-faced impala continues to thrive in Etosha National Park and is one to put on your checklist for your next visit.